Holy cow! That is fab-u-lous. Wow that is beautiful -- and btw the best send off for anyone is with love and laughter mixed in with a few will miss you tears - because without the love and laughter there wouldn't be any of the will miss you tears... sounds to me like you all did it right! 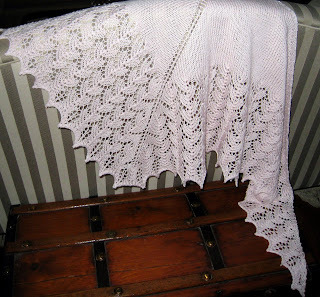 Rosi- as always, your knitting is beautiful! I am sure your Aunt was proud to have you in her family. How lucky we are when someone brings us both love & laughter. I am sorry for your loss. And as usual, you knitting is bee-ute-tee-full.